Each one of us is a soul on the journey of soul evolution through our earthly existence. We all have chosen our own unique life experiences based on our own need for soul growth. As a soul, each one of us is a powerhouse of energy, and we are invincible. In truth, there is nothing we can’t accomplish! However, our own unresolved past life issues and energy, our growing up experiences, traditions, conditioning and beliefs have created fear, doubt, lack of confidence, low self-esteem and insecurity in us, and prevented us from reaching our full potential so we can live our life as it is meant to be. Each of us in one way or another has given our own power away, either through fear or emotional reactions to people, situations and events. 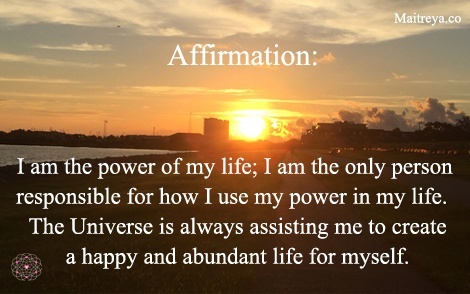 This affirmation is designed for Self-Empowerment with the intention to raise our awareness that we have the power to create and to live our life to its highest potential, and that we can have the happy and abundant life that our heart desires. We are the power of creation and manifestation in our life! The Universe is with each of us! You can say this affirmation whenever you feel you need it: in the morning, in the evening, while you are walking in the nature, etc. The more you say it, the more you will be aware of it, and the more positive change will take place within, and the more positive reality you can manifest in your life. It will not happen overnight, but slowly and surely, you will see the change.